this product does exactly what it says, at the moment cannot be beaten for this quality at this price. 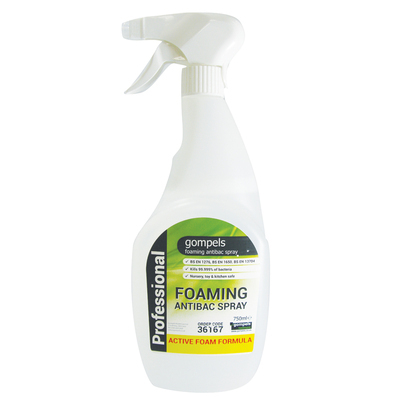 From our own range here at Gompels, this Foaming Antibacterial Cleansing Spray has been developed to challenge the leading brands on the market. Formulated with the same ingredients as Dettol, it's foam mixture boasts anti-bacterial properties and gets into all the awkward corners to ensure the cleanest and most hygienic finish. The visible nature of the foam creates a practical way of tracking your cleaning process while the active antibacterial technology is 99.999% effective against a wide range of common bacteria. Suitable for use on kitchen surfaces, hobs and anywhere where food is prepared, the functional cleansing spray comes in ergonomically designed spray bottles with easily functioning spray nozzles. This large pack of 6 provides ample cleaning equipment for a large care home or, alternatively, keeps your stocks continually high. Compliant with BS EN 1276:2009, BS EN 13704:2002 and BS EN 1650:2008. 99.999% effective against E.Coli, Staph Aureus, Pseudomonas Aeruginosa, C.Diff and other sporicidal activity. Here at Gompels, we strive to deliver the best quality for the best prices. With everything from multipack Everyday Blue Centrefeed Rolls through to Azomax Spray and Purell Advanced Hygienic Hand Rub Cartridges, you'll find all the essential items for your workplace and at exceptional wholesale prices.